Introducing the Marigold Health Food range of ‘MUST HAVE’ products for every kitchen. Varied and vegetarian, every product enhances your meals and delights your palate. We focus on what’s really important to health food lovers: locating primo quality health food products from the source for our Australian and New Zealand markets. 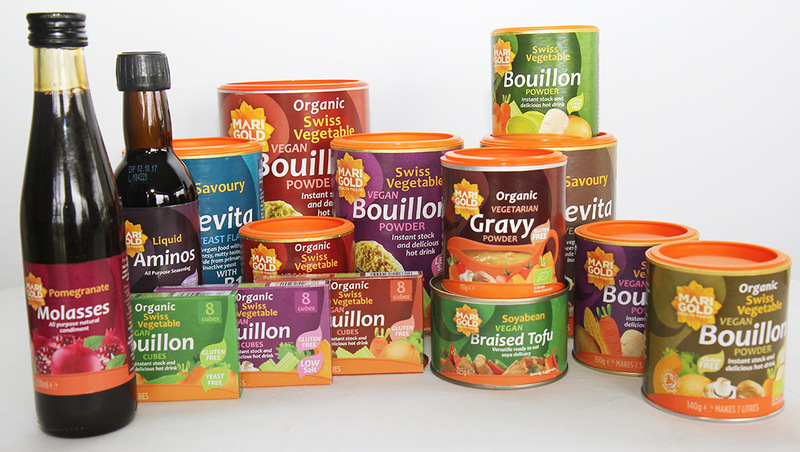 Our range begins with Marigold Swiss Vegetable Bouillon, available in both powder form and cubes. Marigold Bouillon provides the perfect seasoning for any savoury dish: casseroles, stews, cous cous, risotto, sauces, rice and grain dishes, salad dressings, noodles and stir fries. Marigold Bouillon is often used as an instant soup stock or broth, or to make probably the most delicious, completely natural, caffeine-free hot drink you’ll taste. Over time, to suit our users’ particular preferences, we have introduced new varieties of this instant stock and now offer organic, reduced salt, gluten and yeast free varieties. Three varieties of the stock cubes version are now available as well, for those who really do prefer cubes to the powder form. Our other vegan and vegetarian products include a gravy that’s both organic and gluten free, two varieties of Savoury Yeast Flakes so rich in B-group vitamins, gluten- and yeast-free Liquid Aminos, long-lasting Braised Tofu in a convenient tin, and tasty Middle Eastern Pomegranate Molasses. If you haven’t already – try some! Like our regular users, once you’ve tasted our products, we’re hoping you’ll be back for more.